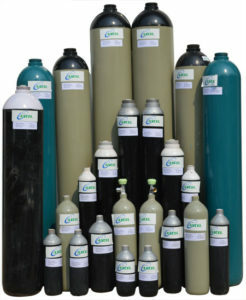 We are a renowned Sulfur Dioxide Gas Dealers and Suppliers in India. It is basically a colorless and toxic gas and used majorly for food preservation purpose only. It is available in very less concentration in earth’s atmosphere. During volcanic eruption activity, a large amount of Sulfur dioxide gas gets released. The major source of production of Sulfur dioxide is by combustion of pure Sulfur. Sometimes it is also produced by sulfide ore combustion process in air. Majorly it is produced for the production of Sulfuric Acid which gets used in various chemical process and industries. Sulfur Dioxide is a green house gas and sometimes referred as a major Air Pollutant. It is also hazardous for living beings including human. Due to its toxic nature, it is the major reason for Acid / Chemical rain which is an undesirable phenomenon. This is the main reason, use of Sulfur dioxide is getting undesirable day by day. In production of Sulfuric Acid. In wine industry for preservation of the same. As a preservative for dry fruits. As a reducing agent in chemical Industry. Sometimes it is also used as a refrigerant. These are some of the common uses of Sulfur Dioxide. There are various other ways in which Sulfur dioxide can be used in a particular industry or process.